Have you noticed the enormous amount of teeth whitening products in the marketplace? There seems to be no end to the over the counter, mail order and professional teeth whitening options for people who want to brighten their smile. If you have dark or stained teeth, there are numerous options to help turn your lack luster smile from drab to fab. It is important however, to take precautions when whitening, so whether you’re whitening at home or having it done professionally, here are a few tips to consider for healthy and effective results. Start by seeking advice and a professional teeth cleaning and checkup from your dentist. It’s always a good idea to have a thorough cleaning prior to whitening for the best results. Your dentist will check for any problem areas or cavities that are developing. It’s important to treat cavities before you whiten. Your dentist will also check the health of your gums. You should not whiten if you have inflamed or problematic gums. If you are not looking to have professional whitening done from your dentists, your dentist can give the best advice for which over the counter products would work best for the results you desire. If you do decide to try at home whitening you should know what you are buying and how to administer the products. At home products vary in strength and concentrations of peroxide (usually carbamide peroxide). They can range from 10% to 20%, so target a product that is somewhere in the middle to test the tolerance level for your teeth and mouth. You should narrow your selection by choosing a product that is endorsed with the American Dental Association Seal of Acceptance. Stick to the directions of the whitening product carefully. It’s not a good idea to over-do whitening by leaving products on longer than recommended. Stay away from soda, sports drinks or other acidic or high staining drinks for several hours or the remainder of the day after whitening. If you are pregnant or nursing, you should wait to whiten just to be safe. Remember, dental work like porcelain or composite crowns, veneers and fillings won’t lighten. It is normal to experience mild, temporary tooth sensitivity. If you encounter lasting gum irritation or extreme sensitivity, you should discontinue whitening immediately. 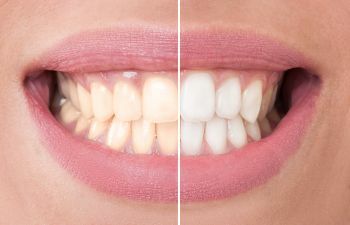 When your teeth reach a realistic shade, you can repeat bleaching sessions twice a year or less to maintain the results.